Welcome to Welcome Home Wednesdays number 87! Let’s get started! We love to see your amazing work around here! Don’t forget to leave us a comment to let us know you stopped by and we’ll do the same when we visit your link! The party will start each Wednesday at 7am CST… and we’ll be here bright eyed, bushy tailed and ready to party! Stop by and share your fabulous posts… we would love to read them and share them with our friends! 6 Gals, 6 Blogs & 1 Great Party! Link up once to appear on 6 Amazing Blogs! Welcome to Welcome Home Wednesdays number 86! 6 Gals, 6 Blogs & 1 Great Party! Link up once to appear on 7 Amazing Blogs! Today I’m sharing how you can use this wax resist technique to surprise your kids with a message or design that they won’t be able to see until they dye the eggs! This is such a fun and easy way to decorate Easter Eggs! Once you’ve gathered your supplies, the first thing you’ll want to do is hard boil your eggs. Next, you’ll need to decide what type of design or message you want to write on the egg. My girls love having their monogram on everything (it’s a Southern thing! ), so I used some vinyl to create a stencil. Then I filled in the stencil with the white crayon. *You can use any color crayon for this. I only used white so that the design would not be visible until the egg was dyed. I also made a cross design on one of the eggs using a stencil cut out of paper. This can be done without using a stencil but since I’m working with a white crayon, I preferred to have some kind of guideline for my design. Now time for the fun part! I used neon food coloring and added vinegar to make my egg dye. I left the eggs in the dye for 10-15 min to get a really bold color. When you take the egg out of the dye you can see that the color won’t adhere to the areas with the wax. This is one that I did with a few swirls as a test. The final result is surprise design that will be so fun for the kiddos to discover! This easy wax resist technique can be used to create any design or secret message you want! I think it would be fun to write out a clue for the kids that leads them to their Easter baskets or make one of your eggs the “prize” egg if they find the secret design! Welcome to Welcome Home Wednesdays number 85! It’s spring break week here so I’ll be partying from the beach! I hope you are enjoying your spring so far. I can’t wait to see what you’ve been working on! Welcome to Welcome Home Wednesdays number 84! Welcome to Welcome Home Wednesdays number 83! 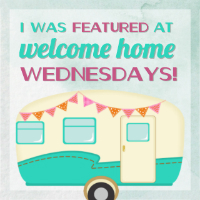 Welcome to Welcome Home Wednesdays number 82! Welcome to Welcome Home Wednesdays number 81! This post was originally published on Sweet Tea & Saving Grace. I absolutely LOVE wooden signs! I’m so excited that I’ve figured out an easy way to make them myself and I can’t wait to share it with you! My collection of signs is definitely growing and I especially love signs with quotes. I came across an Irish Blessing quote from Thomas Osborne Davis and I knew right away that I wanted to make a welcome sign for my entryway! I’m sharing some easy tips for creating this Irish Blessing Sign so you can have one for yourself without spending a fortune (and there’s NO TOOLS NEEDED)! So, here’s what makes this project so easy. You can find everything you need at a craft store! There’s no need to go to the home improvement store for the wood. I found this sheet of birch plywood already cut to the perfect size (there were multiple sizes available, but I chose 12in x 24in). Right next to the plywood were these long strips of balsa wood! Why on earth have I never used this stuff before? It’s so lightweight! It feels more like foam than wood. They were perfect for framing out my sign. I ended up needing 3 strips of balsa wood to frame out my sign. I simply measured the length I needed and marked it with a pencil. Then, I cut each piece with an Xacto knife. You can actually just snap them in half but I was able to get a nice clean cut with the Xacto. I painted the sheet of plywood with white chalky paint that was watered a little so it would show some of the natural wood underneath. Then I stained the balsa wood with a dark walnut stain. I typed up my quote in Canva using a template that was the size of my plywood. Canva allows you to add line and text spacing so I was able to get the words lined up just the way I wanted them. I then printed the quote by choosing the poster option. This broke it up into 4 sheets of paper. Make sure you check the option to add crop marks. These will help you line everything up correctly! I taped the sheets of paper together and lined them up on my plywood. I taped it down in a few places to make sure it didn’t move around. To transfer the letters to the wood I used my favorite method…carbon paper! Just slide it underneath the paper with the carbon side facing down and start tracing. This part can be a little tedious but it’s totally worth it when you’re done! Once all the words were traced onto the board, I filled them in with a black paint pen. The final step was to frame out the sign with the balsa wood strips. Since these are so lightweight, I just used wood glue. It worked pretty well. My wood was a little warped so I used a clamp but it’s not necessary. I love the way it turned out and it looks great over my mudroom bench! See! No big tools or equipment needed and since I already had the paint and stain, this project only costs me about $15! We’ve had the joy of sponsoring a little girl from Uganda through Compassion International since she was 5 (she is now 11 and the same age as our oldest daughter). After going through the Compassion Experience a few months ago, we decided to sponsor our second child. We found a little boy from Ethiopia. He is 8 years old (same as our youngest daughter) and was in desperate need of a sponsor. Each year we receive an updated photo of our sponsored child to show how much they are growing. I’ve always placed these photos on the fridge, thinking it would be a place to keep them in our minds. When our kids were small the fridge was a place of honor for finger paintings and drawings, but as they’ve gotten older it’s turned into a place for football schedule magnets and dentist appointment reminders. I felt the Lord telling me not to put their photos there but to create a special place to hang them just as we would those of our own children. I immediately thought of the words, “They are precious in His sight” and I got to work making this frame! I found this stained pallet wood at Michael’s that was meant for hanging and it was the perfect size for my photos. This world map from Etsy comes in multiple sizes. I chose the 12in x 12in size. I used a white chalky paint to fill in the stencil. It’s very intricate and I have a blob where I should have lakes/rivers. 🙁 Oh well, it still gets the point across and I like the way it turned out in the end. The words to the song were added using my Cricut and white vinyl. If you don’t have a cutting machine you can paint the words on (try the carbon transfer method). The final step was to wrap some twine around the top a few times. I secured it with hot glue in the back and then added some small clothes pins. Now I have this really sweet frame where I can hang photos of our own children as well as our sponsored children. This frame serves as a reminder that our sponsored children are just as precious to the Lord as the children living in our home! There are so many children that need sponsors and we wanted to help them all. We decided to choose our children based on their birthdays being close to our kids’ birthdays. Our little boy has the exact same birthday as me…there’s no way I will ever forget him on his birthday! Want to know if you share a birthday with a child in need?